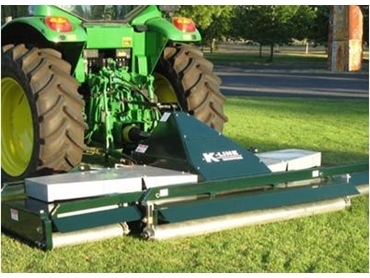 VR Series mowers from K-Line Industries are precision cut mowers for large areas that in previous times would have needed to be cut by smaller and slower machinery. With fast operation and a high tip speed, the unique quad blade spinners will give the cut an excellent finishing look. Featuring hydraulic folding wings that are lever operated, the precious mowers have a 2.5m transport width for road travel and are easy to service and maintain. All machines come fully guarded with safety, which is a key feature throughout the K-Line range. With six large heavy duty rollers, a fast and simple adjustment for cutting heights is required. Also featuring a twin V-belt drive to all the spindles, the spindle assembly is simple to exchange. The mowers also have optional trailing castor wheels, light kits and warning signs if required.